Breach of trust: how Washington turns outsiders into insiders. · One Book. One Author. One Hour. Notes on front endpapers include some biographical information on the author and his family and refer to his intention to change the culture of Washington when he was elected to Congress in 1994, and give examples of politicians being unwilling to change the system, e.g. Trent Lott, John Kasich, Bill Thomas, Newt Gingrich, and Bob Dole. Careerism, the pursuit of reelection above all else, is identified as the governing philosophy in Washington. It is noted that several loopholes which were closed in the 1990's - e.g. allowing corporations to buy members all expenses paid vacations to 'charity' events, limiting committee spending, and imposing term limits - are again being reopened under Bush. Back endpapers contain notes referring to bias in the media, to the failure of the author's non-confrontational strategy, to the 1998 mid-term election when the Lewinsky scandal mobilized the Republican base, and to excessive highway spending from 1982 to 1998. Other notes show the author's disillusionment with Washington where the only purpose of politicians is their self-preservation, include notes on the future of Social Security and Medicare, the high price of prescription drugs in the U.S., and mention two politicians who the author enjoyed working with - Tony Hall and John Baldacci - as well as a list of eight statements dispersed throughout the book detailing what Congress doesn't want citizens to know. These questions and statements are part of the notes: "What are budget tricks?" -- "The public has a hard time believing any politician today, even when a politician is speaking the truth." -- "Drugs - highest price in the world - when was there a hearing on price fixing?" -- "Social Security - 'Ponzi Scheme' - what is it?" -- Annotations by Brian Lamb in the margins and underlining of pertinent phrases throughout the book. -- Examples: p. 44: "Don't trust what anyone says in Washington because more often than not a political calculation will undermine their commitment." -- p. 56: "Gingrich talked a lot about the importance of listening, but he was often not interested in discussing our ideas." -- p. 62: "The shut-down battle illustrates a chronic problem in a Congress dominated by careerists: Long-term vision and the long-term interests of the country are continually sacrificed at the altar of short-term political expediency." -- p. 204: "Ask yourself when was the last time you read a news article that was free of bias and included a balanced presentation of the facts, whether from a conservative or liberal source." 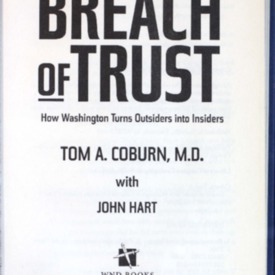 Coburn, Tom A, “Breach of trust: how Washington turns outsiders into insiders.,” One Book. One Author. One Hour., accessed April 19, 2019, http://booknotes.gmu.edu/items/show/732. Breach of Trust takes you directly into Coburn's closed-door coversations with policymakers and sheds new light on the rampant misuse of government funds, pork barrel shenanigans, shameless attempts to "buy" votes, and the unbelievable ways the system often turns politicians against their own constituents-perpetrarting an inexcusable breach of trust on the American public.